Halloween in August? Yes, please and thank you! The first Mickey’s Not So Scary Halloween Party was held on August 17, 2018. We were there and enjoyed it immensely along with the rest of the sold-out crowd. 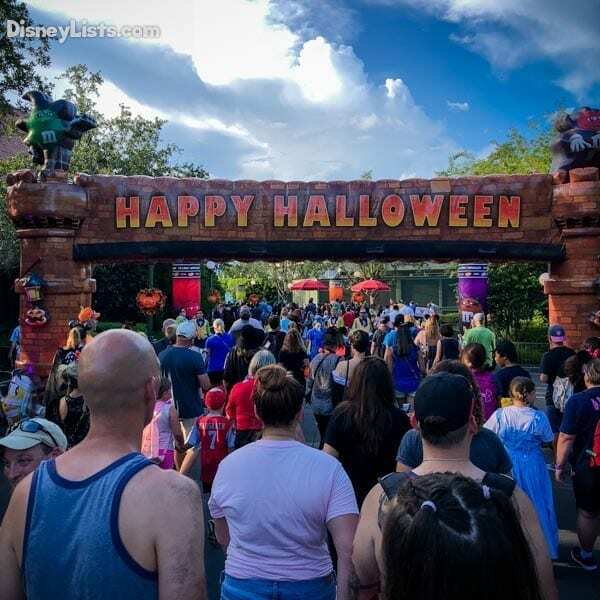 Mickey’s Not So Scary Halloween Party is Disney World’s most popular special ticket event and it’s not hard to see why. This party is awesome! Many dates sell out, particularly in October, so if you’re interested in going book soon. If you’re heading to a Halloween party this year, here are the 13 things to know before you go. The Halloween party is very popular. 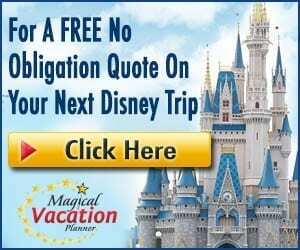 It’s on most people’s must-do list when they are visiting Disney World in the fall. The first party in October 1995 and it only occurred on one night. Since 1995, the party has grown. Last year there was a record 32 parties. This year there are a total of 34 parties, two more than last year. Although Disney added just two more, they also started two weeks earlier this year in mid-August. As we said earlier, we attended opening night, which was sold out. A sold-out party is crazy busy. We think it’s helpful to have the right expectations on crowd levels so you can have the best night possible. It will be busy. Main Street USA will be packed most of the night. 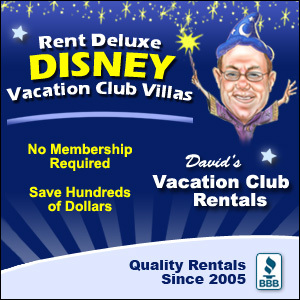 The special party activities draw the crowds so you’ll see reasonable waits for attractions. 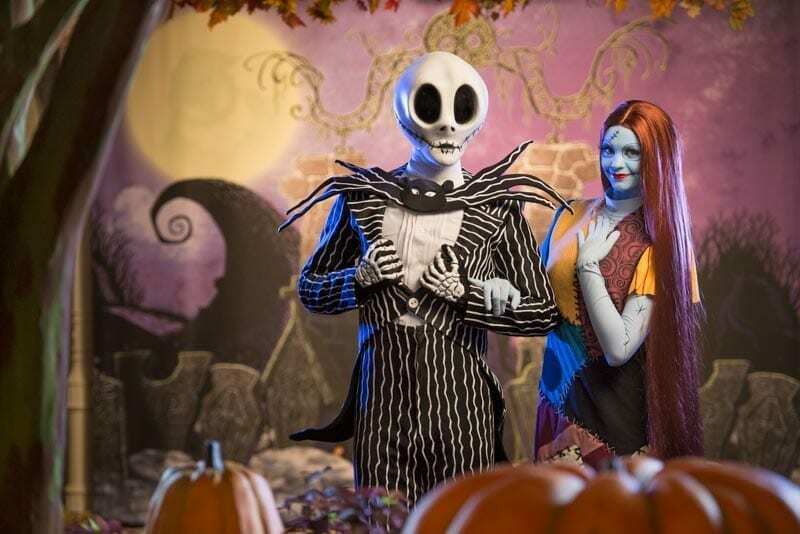 However, expect very long waits for characters, especially the most popular characters such as Jack Skellington and Sally. That doesn’t mean you won’t have fun, but do not expect an empty park where you will walk onto attractions. Think of Halloween weather and you may picture a crisp, cool fall night. Not at Disney World. Expect a very warm party evening, especially in August and September. In both of these months, highs are still in the lower 90s, so the party will begin in the upper 80s and stay there. It will also be crazy humid through early October. In October, you may find some relief, (one year we went to the party and it was in the 60s!) but usually, you should expect a very warm evening. You’ll want to dress accordingly! While the Halloween Party hours are from 7:00 pm – 12:00 am, guests can arrive and enter Magic Kingdom at 4:00 pm with their party tickets. We highly recommend that you do this! Enter as soon as you can and ride attractions that are on your must-do list. Also, eat your dinner before 7:00 pm so when the party begins you can focus on party only options for the evening. The park closes at 6:00 pm to regular day guests and this really helps clear out the park just in time for the party to begin at 7:00 pm. Again this year, you’ll find Market Street entry. To help the flow of day guests exiting the park, party guests are being led to the right of Main Street USA to a backstage area usually used to relieve Main Street crowding on busy days. 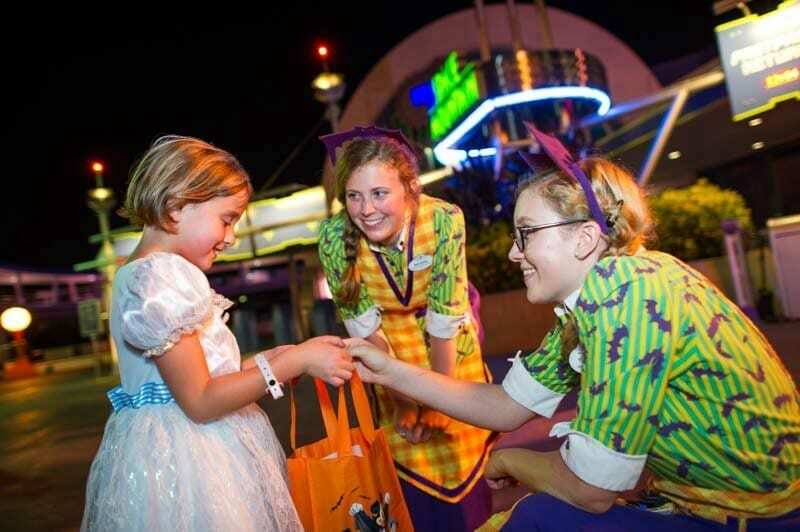 Here, guests receive treat bags and go through a few Treat stops so you’ll begin the evening with candy right off the bat! See the photo above for the setup. It worked nicely. However, if you want to experience walking down Main Street USA you’ll need to hang a left and go back down Main Street. This set up certainly helped alleviate the traffic jam that normally takes place while many people are trying to enter and exit the park at the same time. Note that this Market Street entry is open through 8:00 pm. If you come to the party after 8:00 you’ll just be able to walk down Main Street as usual. On the flip side, to get everything you can out of the evening, plan on staying very late. The party officially ends at midnight, but there are a few reasons to stick around after that. 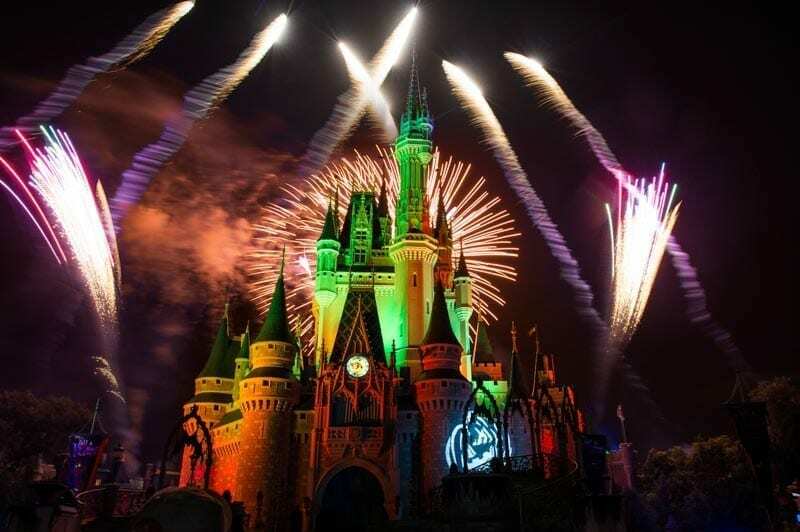 First, you can plan on catching the amazing stage show, “Hocus Pocus Villain Spelltacular,” at midnight – the last show. The show is about 15 minutes long and by catching the midnight performance you’ll free up time during the party to do other things. Also, as long as you are in line for an attraction by 11:59 pm, you’ll be able to ride that attraction. While most shops and restaurants close promptly at midnight, shops along Main Street USA, including Main Street Bakery and Emporium, remain open. We left at 12:40 am and there were still a lot of people around. Disney PhotoPass photographers were also still on Main Street taking photos, as well as out near the Magic Kingdom Entrance. Feel free to take time to get these last photos and enjoy the party ambiance! 5 – There are New Things to Check Out This Year! Disney is offering five new experiences at the party this year. Even if you’ve been to the party many times before, you’ll have new things to try. Review: this was a bit disappointing. There were only two live pirates. 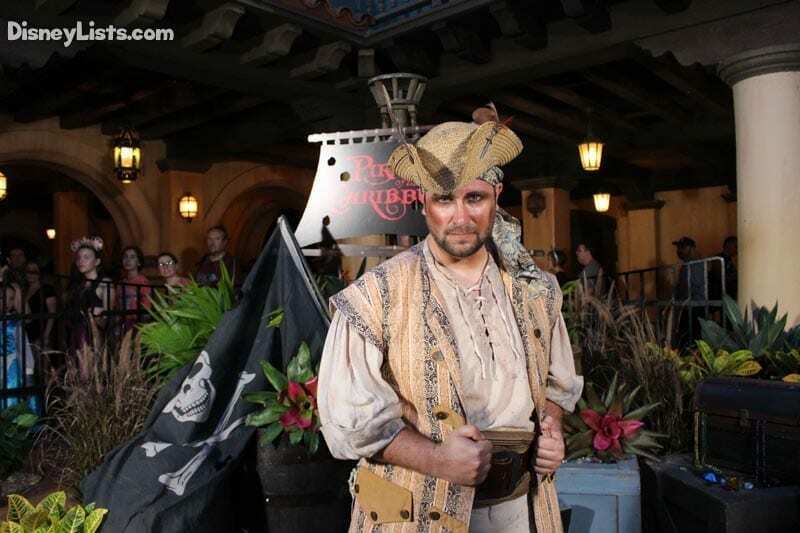 One pirate interacted with guests in the boarding area, and one while on the ride. We felt this could have been a bit more exciting, but we appreciate the effort by Disney to liven up the ride. The Mad Tea Party takes guests on a colorful teacup ride, as special lighting and other effects, put a glowing new spin on the attraction at night. Review: this was very cool! Be sure to check this out, even if you can’t ride like me due to motion sickness. The lighting and music were really cool and tied in perfectly to the weirdness of Alice in Wonderland. Honestly, we think Disney should consider keeping this overlay permanently. Review: This was the highlight of the evening! When they say is will be dark they mean completely dark. All lights and lighting effect were off, and you literally could not see a hand in front of your face (we tried). The attraction was completely changed and was an entirely new experience. We loved it and heard many around us agree! This is a big hit. If you love Space Mountain, be sure to ride this at least once during the party. Review: The party was a fun addition. We observed a few families enjoying this. Both Doc McStuffins and Timon were there. If you have little ones, they will likely enjoy this! Mickey’s Not So Scary Halloween Party features amazing entertainment. In addition to the new offerings, you’ll enjoy Mickey’s Boo to You Halloween Parade (9:15 and 11:15), Happy HalloWishes Fireworks (10:15), the Monstrous Scream-O-Ween Ball (7-12), and the stage show Hocus Pocus Villain Spelltacular (8:30, 10:45, 12:00). We feel the Halloween party offers the best entertainment of all special events, period. The parade is a must-do, especially since there is no nighttime parade anymore in the Magic Kingdom. The fireworks are fantastic, and Hocus Pocus is frightfully good! We think the Boo to You Halloween Parade is the best parade Disney has ever put together (yes, better than the Christmas parade). However, the best part comes shortly before the official start of the parade when the Headless Horseman rides the parade route. DO NOT MISS THIS! This is the highlight of the party and is worth the price of admission. Seeing the Headless Horseman atop his huge, beautiful black stallion is breathtakingly eerie. There are many ways to schedule your evening (see #12), but keep in mind the schedule of these entertainment options so you don’t miss them! Character appearances are subject to change. We’ve already suggested you come to the party early to eat dinner, but you’ll want to save some room for the many treats available only at the party. Be sure to read our news article, Special Halloween and Mickey’s Not So Scary Party Treats Revealed, for all the details! There are 14 different treat locations around the party that will distribute candy throughout the evening. How much candy you receive is up to you. Obviously, the more stations you go to the more candy you’ll get. Right at the beginning of the party, the lines for candy are longer. You are free to go through the lines as many times as you like and candy is given by the handful. We recommend you wait a bit until you can walk through the treat lines with no waits. A bonus this year is that when you enter Mickey’s PhilharMagic, The Legend of Sleepy Hollow, is playing on the screen. (Other Disney shorts may play during the evening). This is a family favorite of ours, so it was nice to catch a quick break while enjoying watching part of the film. Finally, don’t worry about getting the garbage candy the mean old lady down the street always gives out. The party features top-shelf candy choices such as M&M’s, Snickers, Skittles and more. There is a large variety of premium choices so everyone will find something they like. In addition to the fabulous food choices, there are a lot of great merchandise options available. Get your wallets ready! Catch a glimpse of the party items by clicking on our news article here. To get these party specific event merchandise head over to either Emporium on Main Street USA or Big Top Souvenirs. Both have the full event collection. You can find costume pieces at Curtain Call Collectibles and Event Trading Pins at Frontier Trading Post. Please note that some event merchandise will sell out. If there is something you really want, head to the stores as soon as possible for the best selection! You can certainly just show up to the party without a plan and have a good time. However, we feel if you want to maximize your time at the party and get the most accomplished, it’s best to have a plan. Think about what you absolutely want to do and see. What characters are you dying (see what we did there?) to meet? What entertainment do you have to see? What items can be saved for another time? The planning process doesn’t have to be overly complicated. Even just taking a few minutes and asking yourself questions like these can help you make a tentative plan for the evening. Even with a plan, you’ll want to be flexible and go with the flow. Our best suggestion to get the most out of your party experience is to skip the attractions that you can ride on any normal day. Focus on the party specific experiences first. 13 – The Party is a Whole Lot of Fun! 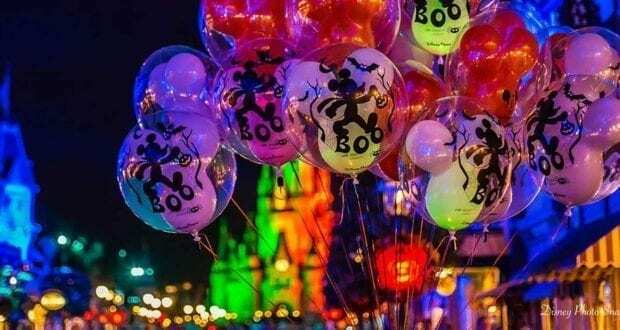 The main takeaway we want you to have is that Mickey’s Not So Scary Halloween Party is a whole lot of fun and a fantastic way to spending an evening at Magic Kingdom. Between the special event entertainment, food, merchandise, rare characters, and atmosphere it’s really worth the extra money for the party ticket. It’s our favorite hard ticket event and it continues to improve every year! We highly recommend it and we hope knowing these 13 tips will help you have a spooktacular evening! For more tips on making your visit to Mickey’s Not So Scary Halloween Party a screaming good time, check out our follow up article, 4 More Things to Know Before You Go to Mickey’s Not So Scary Halloween Party.